River Daze is very nice and has a well stocked kitchen. It was neat and clean when we arrived. We will use Mountain Resort Cabin rentals in the future. It was a very nice stay. "Dream Catcher" had everything we could ask for. The cabin was very nicely arranged and supplied. We had no problems enjoying all the time that we were there. Very much we enjoyed the deer outside. All together, we had a great time and would definitely enjoy using the cabin again. Awesome Cabin and Resort Vacation !!!!!! Overall our stay was perfect. Everyone in the resort, town of Ellijay and surrounding area were very friendly. I think that everyone should experience a mountain vacation. We are a black family with several small grandchildren, mid 20s and 30s adult children. Everyone was very helpful from planning the cabin to all the activities. From hiking, zip lining, rafting and horseback riding. To all the businesses in Ellijay and Jasper Thank you. And a big shout out to Mountain Resorts Cabin Rentals. Valerie and Barbara were great to work with. We will be back! Had to get used to driving on very narrow mountain roads! Still had a great time. OMG the mountain air is perfect for relaxing and sleeping. Memorial Day Weekend 2018! White Water Lodge - We pick our cabins in North Georgia often for the water view / screened porches. This was the cleanest cabin by far. The Coosawattee River view was so enjoyable! A++ on the porch!! No spider webs, dead bugs or dust. You could tell the screens had been vacuumed and cleaned of even the pollen!!! Even the manicured lawn leading up to the cabin was enjoyable. The location of White Water Lodge is WONDERFUL! The cabin was neat and clean and the description on the internet was accurate. Thank you! 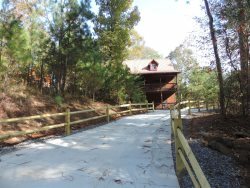 Barnes Creek Retreat was perfect for what we needed.... a home base for Mountain Biking. Well, we had a problem with this cabin.... We didnt want to LEAVE!! Oh My!! Who could ask for anything more??? Thanks Mountain Resort Cabin Rentals - we enjoyed our cabin, our stay and your North Georgia Mountains!!! Fantastic cabin and AMAZING VIEW OF RIVER. Loved seeing deer and geese in the Coosawattee River. We have stayed in a lot of places but love this cabin and features. It was very nice and we enjoyed our stay very much. Friendly staff. Thank you! Wonderful place to stay. This is my 4th stay here and I will be back. Everything is great. Cabin was neat and clean. Staff was nice and responded in a timely manner. We will stay at The Buck Stops Here at least twice a year until I retire here. We love it! Peaceful Cabin Beautiful cabin. Very well kept and clean. Tons of space and the perfect quiet getaway! We had the opportunity to feed nearly a dozen deer from the deck, sleep in and enjoy the game room! Everything was awesome - let us stay longer for free (kidding). Love Love Love its our second time and we so look forward to it. We will be back soon I hope. Housekeeping does a great job - very impressed. Everything was lovely - great cabin!!! Beautiful location. Great for our dogs & family. We have stayed in 2 other cabins in the Coosawattee River Resort and this cabin by far is the BEST!!! Everything was amazing - the office staff was great to work with us. The internet doesnt do justice to the cabin as it is prettier in person. We loved it all!!! Thanks so much and thanks to Stefanie her work is excellent and appreciated! Everything was perfect - the cabin was very neat, clean and had everything we needed. We will return! Cabin was great and clean. Thanks for all you did and helped with to make this weekend happen. The customer service at the office was amazing. Thank you so much for everything. We had an amazing time and will contact you soon to set up for Christmas. Everything was perfect at the cabin - nothing to change. Again, thank you so much, your company is amazing and I will refer you to everyone I know. This cabin was wonderful and we will certainly be back. The internet doesnt do it justice. It was much more than we expected; we wanted to stay longer. Office staff was great and very informative. We cant wait to return. This cabin was very well organized and clean when we arrived. Customer service girls were very helpful. We cant wait to return.